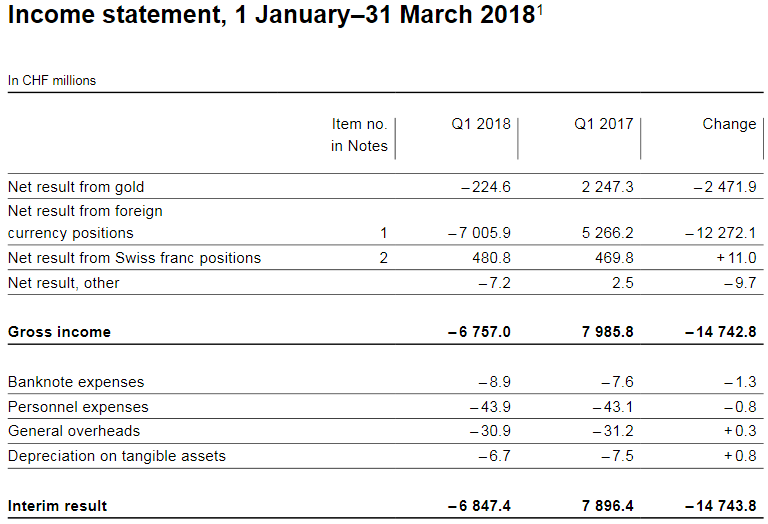 The Swiss National Bank (SNB) reports a loss of CHF 7.8 billion for the first three quarters of 2018. 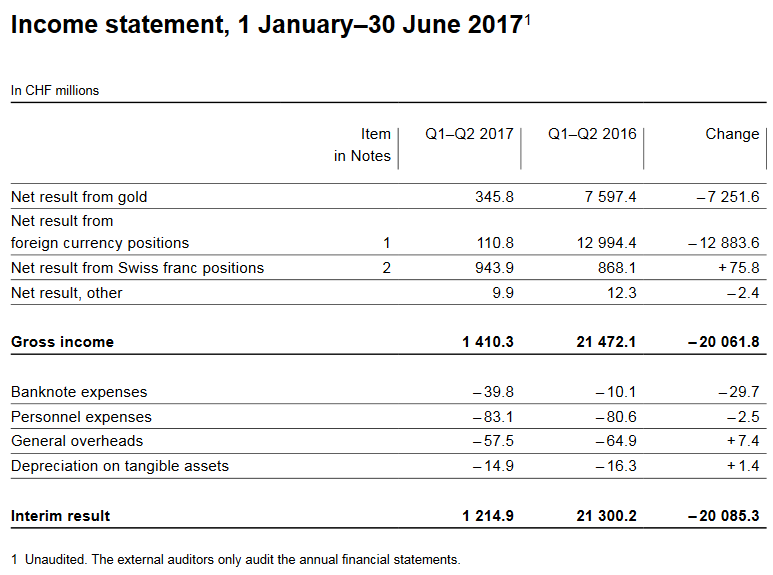 A valuation loss of CHF 3.7 billion was recorded on gold holdings. 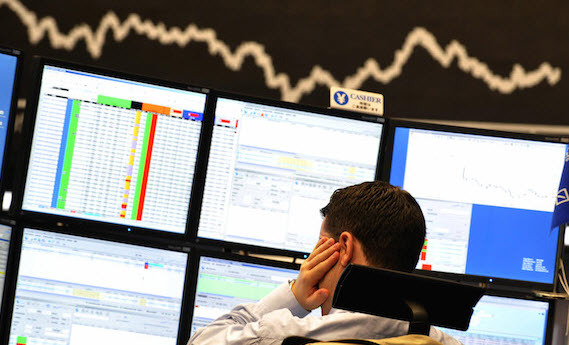 The loss on foreign currency positions amounted to CHF 5.3 billion. 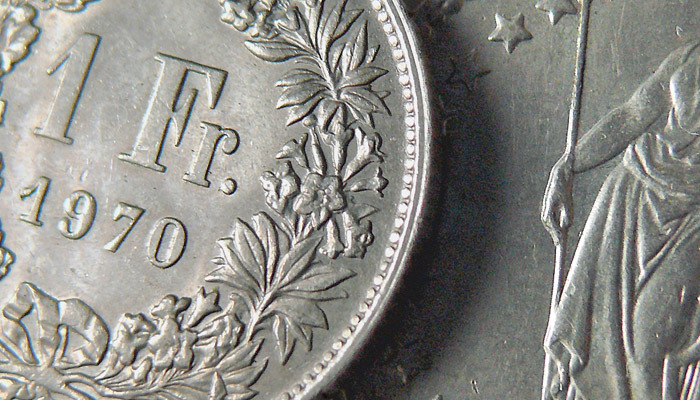 The profit on Swiss franc positions was CHF 1.5 billion. 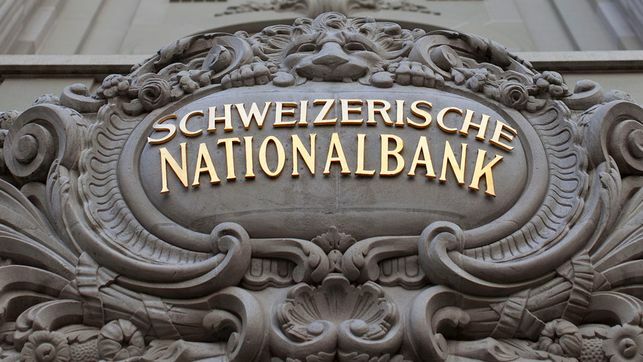 The Swiss National Bank (SNB) reports a profit of CHF 5.1 billion for the first half of 2018. 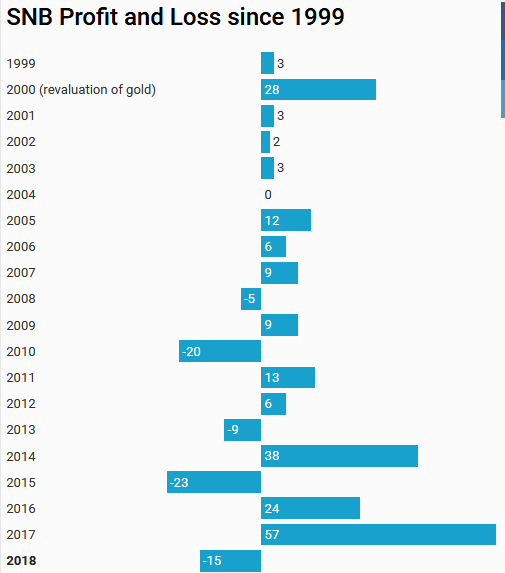 A valuation loss of CHF 0.9 billion was recorded on gold holdings. The profit on foreign currency positions amounted to CHF 5.2 billion. 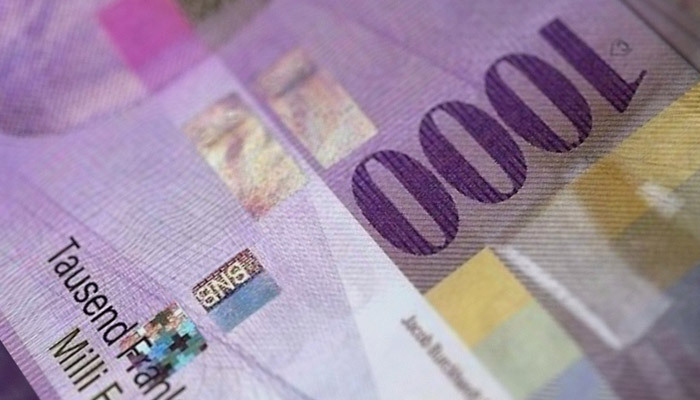 The profit on Swiss franc positions was CHF 1.0 billion. 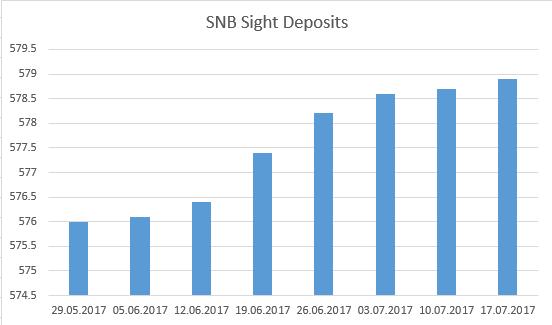 The Swiss National Bank (SNB) reports a loss of CHF 6.8 billion for the first quarter of 2018. A valuation loss of CHF 0.2 billion was recorded on gold holdings. 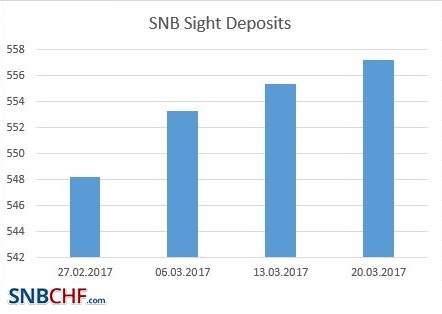 The SNB’s financial result depends largely on developments in the gold, foreign exchange and capital markets. Strong fluctuations are therefore to be expected, and only provisional conclusions are possible as regards the annual result. 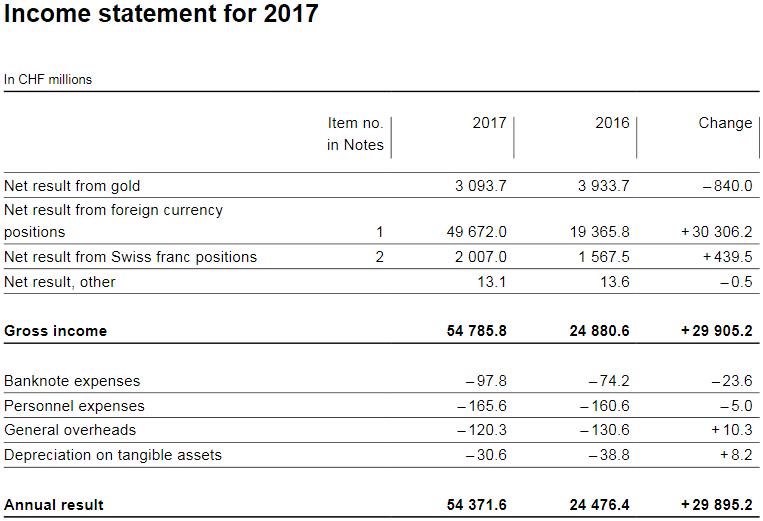 The Swiss National Bank (SNB) reports a profit of CHF 54.4 billion for the year 2017 (2016: CHF 24.5 billion). The profit on foreign currency positions amounted to CHF 49.7 billion. 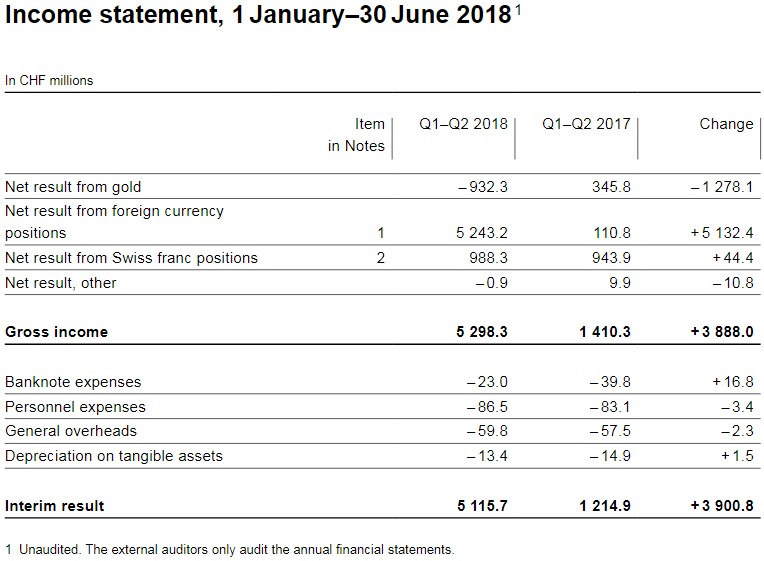 A valuation gain of CHF 3.1 billion was recorded on gold holdings. 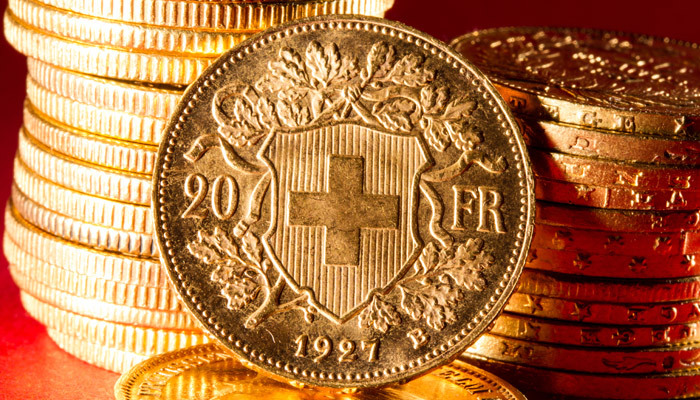 The profit on Swiss franc positions was CHF 2.0 billion. The Swiss National Bank (SNB) reports a profit of CHF 33.7 billion for the first three quarters of 2017. But in 2017, the picture is changed. 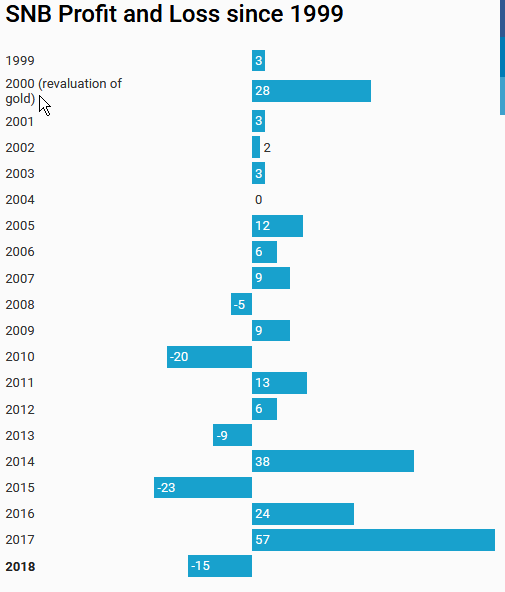 Assuming a "biblical" cycle of seven good years and seven bad years, the SNB could now increase profits every year - thanks to a weaker franc and the seven good years. Despite the tensions between Donald Trump and North Korea's Kim Jong-un, the EUR/CHF only depreciated to 1.13. 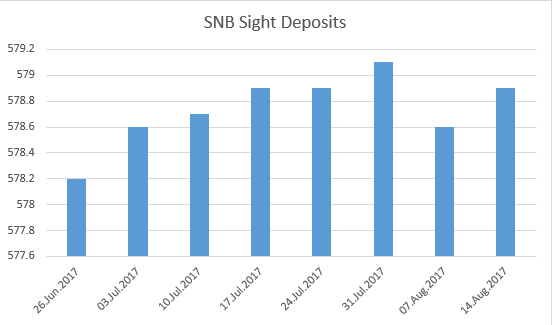 In the last week, the SNB did not have to intervene. This proves that investors have not taken the tensions seriously. 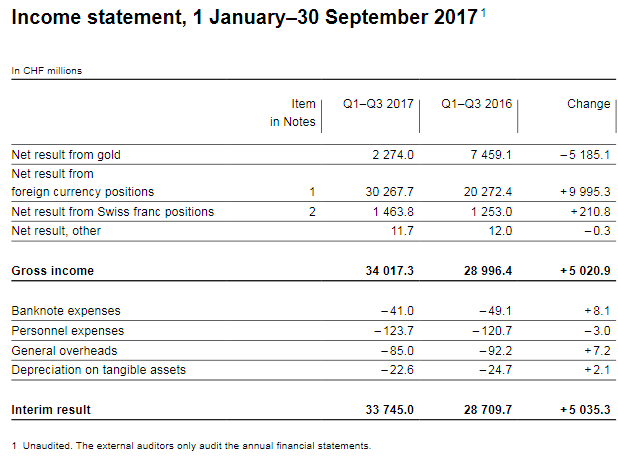 The Swiss National Bank (SNB) reports a profit of CHF 1.2 billion for the first half of 2017. A valuation gain of CHF 0.3 billion was recorded on gold holdings. The profit on foreign currency positions amounted to CHF 0.1 billion and the profit on Swiss franc positions stood at CHF 0.9 billion. The SNB’s financial result depends largely on developments in the gold, foreign exchange and capital markets. Hawkish comments by Mario Draghi boosted the EUR against both USD and CHF. 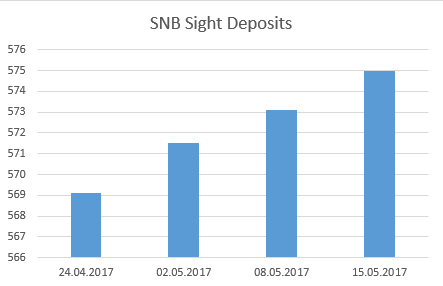 It also reduced the need for SNB interventions. The question is how long Draghi will remain hawkish, especially next winter, when headline inflation in the euro zone may fall under 1%. The centre-left politician Macron has won the French elections. His success moved the EUR/CHF up to 1.0960, mostly caused by FX speculators. But serious investors - i.e. not FX speculators - did not follow the political event. 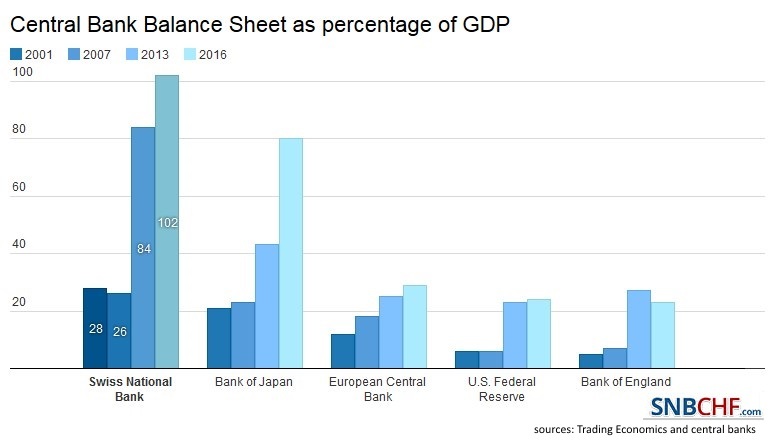 The SNB had to intervene for 1.6 bn francs. The centre-left politician Macron has won the French elections. He is a politician that - similar to Hollande four years ago - promises economic improvements, move investment, more jobs. Mostly probably he will fail similar to Hollande. 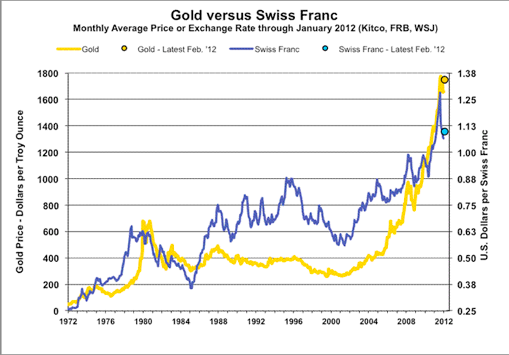 His success moved the EUR/CHF up to 1.0865, mostly caused by FX speculators, but the SNB had to intervene. 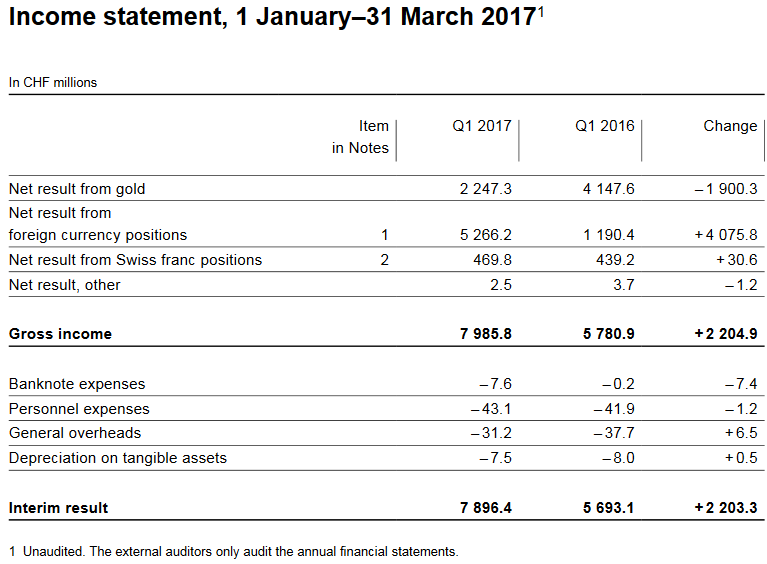 The SNB reports a profit of 7.9 bn CHF, of which 2.2 bn come from the gold holdings. Given that the bank has introduced a "minimum euro rate" around 1.06-1.07, this is not very difficult. It comes at the price of continuing interventions. 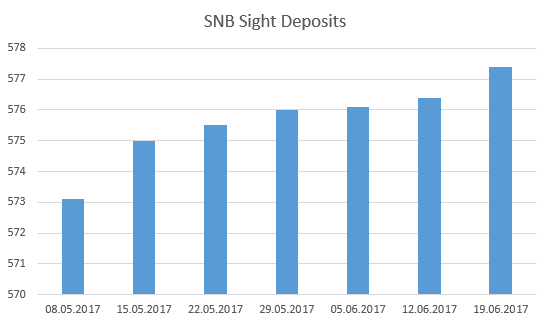 SNB sight deposits changed by 2.4 bn last week, hence the SNB intervened for this amount. This value is a movement back to the weekly intervention trend. We expect a further downtrend of EUR/CHF in the next 2 years. The SNB intervenes for 1.6 bn CHF at EUR/CHF 1.07 - 1.0750. This is less than previously. 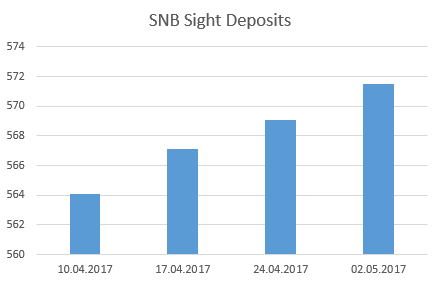 The SNB intervenes for 2.9 bn CHF at EUR/CHF 1.07. For us, clearly too much and too risky; she will not maintain this pace over a longer term. Hence the EUR/CHF is prone to fall again. The EUR/CHF suddenly appreciated with the ECB meeting, when Draghi seemed less dovish than before. The rate rose from the previous 1.0650 to over 1.0750. With the SNB meeting, the EUR/CHF receded again. 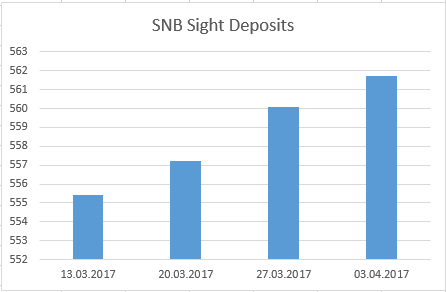 SNB interventions, are currently at 2 bn. per week compared to 5 bn. 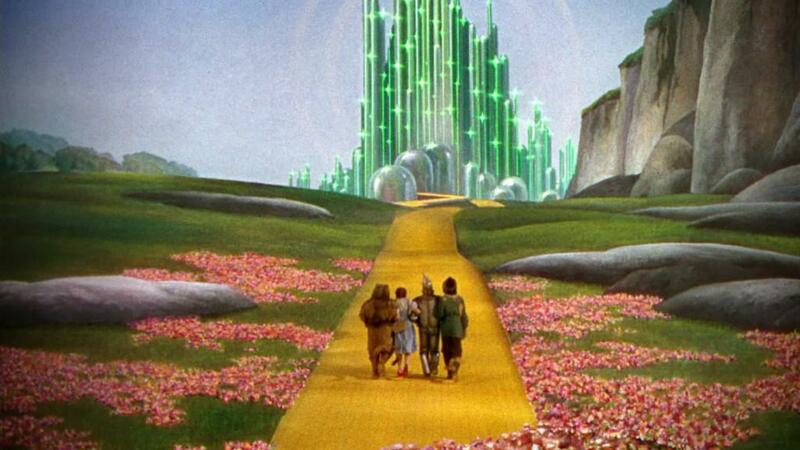 before Draghi.